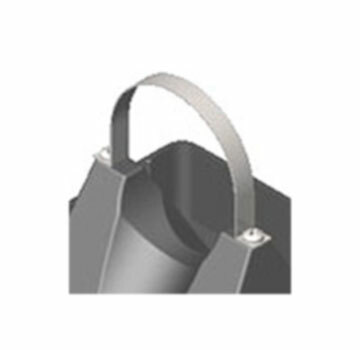 A pipe support used to support roof-mounted gas pipes, electrical conduit, solar piping and other mechanical piping. Unique design absorbs thermal expansion and contraction of pipes thus preventing damage to the roof membrane. Pipes rest in a 'U' shaped cradle situated in a polycarbonate resin seat. Each pipe stand will accommodate up to 1.5" inside diameter pipes. The maximum outside diameter of pipe which can be cradled in the Model 1.5 support is 1.9". 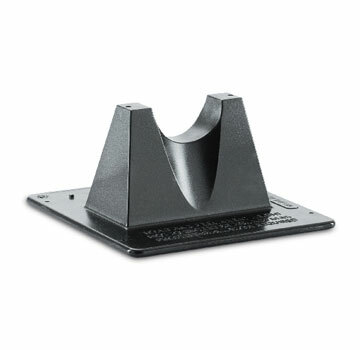 Size: The deck base is 6" square, the stacking platform is 1 1/2" high, the top of the "U" cradle is 3 3/8" high, and the maximum inside width of the cradle is 1.95". Max Pipe Size: 1-1/2" (1.9" outside diameter). Max Pipe Clearance: Pipes supported one pipestand high will have a clearance of 2" over the roof. Max Load Weight: Maximum load weight may not exceed 48 lbs. per pipestand. Spacing: Manufacturer's recommended spacing is not to exceed 10 feet centers depending upon the load. Miro Model 1.5 Pipestrap. Aluminum Pipe Straps Fit Model 1.5 Pipe Supports. Includes #8 Stainless Steel Screws. Price/Each.